When the WP Security Audit Log plugin keeps a log of a change, it records a lot of technical details, though most of them are not reported in the WordPress activity log. For example when a user makes a change in a blog post the plugin records the post type, ID, user session and more. 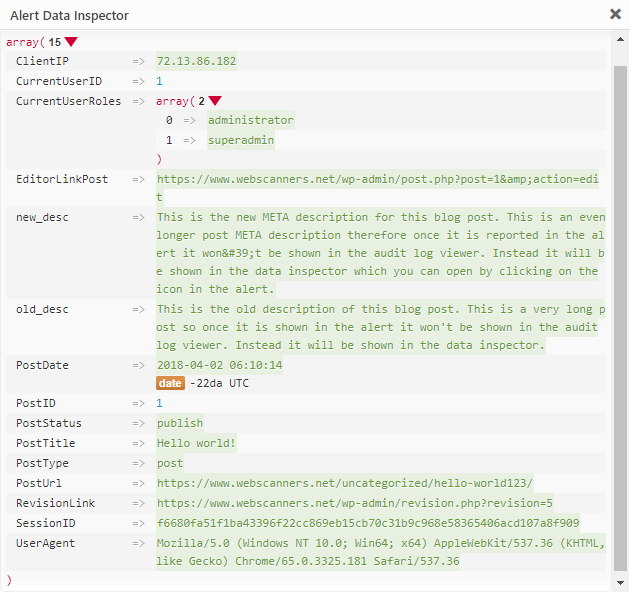 To view all these details you can use the all new Data Inspector, which we introduced with this version update. In previous versions of the plugin we had a less informative Data Inspector and was not enabled by default. When using the WP Security Audit Log plugin you can store the WordPress activity log in an external database. Though what happens if the external database is not available? We have developed a buffer so when the external database is not available the website operations are not stopped. Instead the plugin will keep a buffer of the WordPress activity log in the WordPress database. Once the external database is available again the plugin will automatically migrate the alerts from the buffer to the external database. All of these operations are done automatically and do not require any user interaction, though certainly worth a mention, especially if one of your requirements is high availability! For a complete list of what is new, improved and fixed in this version of the WP Security Audit Log plugin refer to the plugin change log. If you have any questions about the WP Security Audit Log plugin please do not hesitate to get in touch. If you use the plugin and do not have any questions we would appreciate if you can spare a moment to rate it!